Daisy Sanchez takes Regional Mexican Mariachi into new era. BAKERSFIELD, CA - Mariachi music is hundreds of years old and can be traced back to the traditional theatrical productions in Spain. Typically consisting of six to eight violins, two trumpets and a guitar, the sound has evolved, reflecting the many regions of Mexico today. The most admirable component of mariachis is the vocalist, whose operatic style of singing relies on no amplification and is able to move enthusiasts emotionally. The most famous mariachi vocalist have been male and from Mexico, like world renown crooner Vicente Fernandez, the late master of romantic rancheras Pedro Infante, and even pop-star Luis Miguel. But, women have also added their influence including Ana Gabriel, Chayito Valdez and American born pop-stars like Linda Ronstadt and Vicki Carr. Now, from an agricultural and petroleum town called Bakersfield, California, which produced the late country singing ultra star, Buck Owens, comes a new mariachi singer, Daisy Sanchez. A 24-year old Latina mariachi singing sensation who grew up being influenced by soul singer Whitney Houston and has just completed recording a new album, produced by those who have helped Vicente Fernandez. 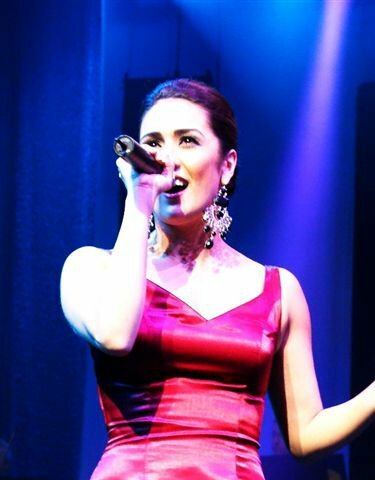 Vida de Oro recently had the opportunity to interview Daisy Sanchez as she prepares to release her new album. VIDA: Tell us, how did you get into singing mariachi? My mother must have been singing a lot of Rancheras when I was in the womb because ever since I can recall singing has been a passion of mine. Growing up I would ask her to teach me songs and I would spend hours singing along to my favorite artists including Vicente Fernandez, Selena, and Whitney Houston among others. When I was 8 I got the courage to sing with 2 of my 6 sisters at weddings, quinceaneras, church choir and anywhere we were given the opportunity to sing. By the time I was 11 I started recording demos as a solo artist. VIDA: When did you get your first break singing mariachi? It was May 31st, 2008 when Vicente Fernandez was in concert at the Rabobank Arena in my hometown of Bakersfield, Ca. I sent a letter to Don Chente asking him for the opportunity to sing with him and a copy of my first Ranchero album. I flung a couple of notes to the stage just in case he didn’t receive my letter. To my surprise, he did receive it and called me on stage to join him during the concert. Eventually leading me to record my latest album “Flor De Hoguera” in his studio located in his ranch in Ja. Mx., then participating as the opening act for various concerts from this last year’s U.S. tour. VIDA: That’s unique and interesting. Can you tell our readers a little about yourself? Do you have support at home? Are you single? How do you see yourself? I was born in Bakersfield, Ca. November 27th, 1984. I have been blessed with parents who have supported me, and my decision to pursue a career in the music industry. I have wholeheartedly dedicated myself to fulfilling my dreams and aspirations putting forth much time and effort. Due to the opportunities I have received there has been a time constraint to follow through with my education. I have attended Bakersfield College and hope to one day, continue my studies in Music. My status? I am married to my career. I am now seeing the fruits of my labor, which still require a lot of work and dedication. I believe timing is everything, and when the time is right I hope to have a family of my own and dedicate myself to them as I have in other aspects of my life. VIDA: How hard was it to reach this point in your music career? There was a time period, your classic scenario of small town girl moves to the big city of L.A. knocking on doors and searching for opportunities. I can remember the frustration of trying so hard and seeing how some things didn’t come through. My faith, family and friends some of whom were dealing with the same frustrations helped me stay positive and encouraged me to keep trying. I am now grateful because this experience taught me life lessons of never giving up and believing in my dreams. I also cherish and value my achievements even more, had I not had obstacles along the way. VIDA: So you took a tough road at first, do you think you’ve reached your goal? I have fulfilled many goals and unexpected things like singing with a legend, and someone I grew up admiring. I still let my dreams run wild, so yes there are more stages I have yet to perform on, more albums to be produced, and places to take my music to. VIDA: Yes, we can see that. So, what type of music or songs, motivate you the most? I am overall proud of my genre of Regional Mexican Mariachi music, which represents my culture, the native country of my parents. I feel proud when I sing songs like “Viva Mexico” and “Cancion Mixteca” and look at the joy and sometimes sadness in the eyes of those who have left their country behind, some of which presently can’t go back. It inspires me that through music you can bring back a sense of home with songs that speak of Mexico and its traditions. I’ve made a promise to my Dad that when he is around and there is a mariachi present I have to sing “Mi Ranchito” because it reminds him of the ranch he grew up in, Zacatecas, Mexico. VIDA: Which songs usually get the best reaction? The songs I have previously mentioned that speak of Mexico bring so much pride and are always a crowd favorite. I must say I have a great following with women when I sing songs of men who have been unfaithful, uncaring, and do not value a good woman. Many women sing along with me to songs like “El Farsante” “Inocente Pobre Amiga” and “Te Parto el Alma” just to name a few. Women, and I include myself, feel attracted to these types of songs because they are empowering, a great outlet when you’ve gone through a similar situation, and remind us not to deal with injustices and unloving relationships. That’s not to say there aren’t any great men out there! As contradicting as this may sound romantic songs like “Sabor a Mi” always grab much attention with the lovebirds in the audience. That is the great thing about Mariachi music it allows you to be versatile and express different emotions whether its melancholy, joy, resentment, or tenderness. Long notes always attract the audience and boy do you need vocal power to interpret a Ranchera! VIDA: Many of our readers are going to want to know more about you and your career, how can they keep track of you? Your readers can visit my web page at www.DaisySanchezmusic.com, which has links to all my social networks. My music including my latest album “Flor de Hoguera” is now available through iTunes, Amazon, and www.morenamusic.com.